Lipoptena cervi, the deer ked or deer fly, is a species of biting fly in the family of louse flies, Hippoboscidae. 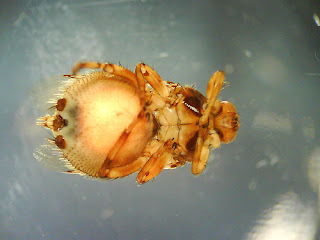 These flies are commonly encountered in temperate areas of Europe, Siberia and Northern China. It has been introduced to North America. 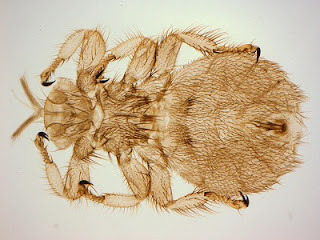 They are parasites of elk, deer and other bovine animals, sucking blood and laying eggs in the fur of the host animals. L. cervi is relatively small, adults usually being 5–7 millimetres (0.20–0.28 in) in length and are brownish in colour. Their body is flat and elastic, making their removal difficult. 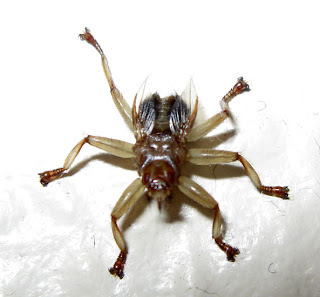 L. cervi is a poor flier and can only fly for short distances. Once the insect reaches its target, it sheds its wings and starts burrowing through the fur.